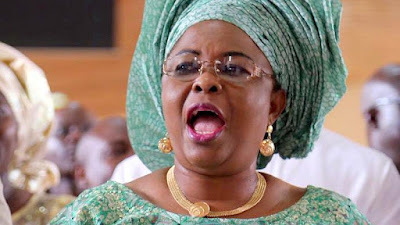 A Federal High Court sitting in Kano has ordered an interim forfeiture of the sum of N1,000,494,000 traced to Magel Resort Limited, a company linked to former First Lady ,Dame Patience Jonathan. The former First Lady and some relatives of former president, Goodluck Jonathan, were directors of the company. The cash was lodged in three deposits with Fidelity Bank Plc on 20th and 25th May, 2015. The order was granted by Justice A. Lewis-Allagoa following an application by the Economic and Financial Crimes Commission (EFCC). The Acting Head of Media and Publicity of EFCC, Mr. Tony Orilade, said in a statement yesterday that the court also ordered that the seized cash be deposited in the Treasury Single Account (TSA) of the Federal Government. He said :”The commission had received an intelligence that a bank account domiciled in Fidelity Bank, had a huge sum of money that was not being used by anybody. “Upon receipt of the intelligence, the EFCC swung into action by conducting preliminary investigation, which revealed that Patience and some relatives of former president, Goodluck Jonathan, were directors of the company. “In trying to trace the origin of the money, it was discovered that N500,000 was deposited on the 20th of May, 2015 by Fynface, who is alleged to be in charge of the company, while N1 billion was transferred in two tranches on the 25th May, 2015 from PAGMAT Oil and Gas Nigeria Limited, a company that was not incorporated with the Corporate Affairs Commission.